Delicious parfait with strawberries. 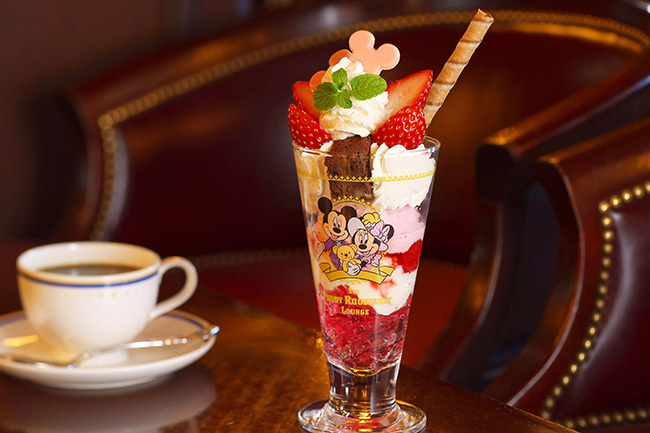 This parfait that have appeared in every season a different flavor of the season as a parfait with Teddy Roosevelt Lounge at Tokyo Disney Sea. Strawberry parfait pink and cute appearance. Come's with collectable glass. Came to Tokyo Disneyland, check the sweets of character shapes and motifs Mickey Kawaiku~tsu delicious! How about (Strawberry & Milk) Sweets hot out of the oven, if the time of Minnie Mouse Man cold now? In addition, have seen the burned in front of classic Mickey waffle also fun. It's cute and Strawberry cheesecake just appeared this month, makes me want to eat sweets are sweet cold it may be cool for some reason! Tokyo Disney Sea'm fairly certain I have the popular sweets secretly even without my character motif! Cream cheese brownie first. Do you know? Moist cream cheese brownie topped the rich sweetness perfect for cold weather! Cute strawberry cream roll cake with the motif of the shells and pearls New York cheese cake with a meet eat has entered firmly is perfect for coffee breaks. And eat sweets popular walk in the park two Tipotoruta. Flavor of orange and cream cheese only Tokyo DisneySea! Orange-flavored cream cheese dough and is a refreshing sweets.